The Keeneland sophomores try to make their mark on the road to Kentucky Derby 2012 in Saturday’s Grade 1 Blue Grass Stakes and juvenile champ Hansen is the strong 6-5 morning line choice. 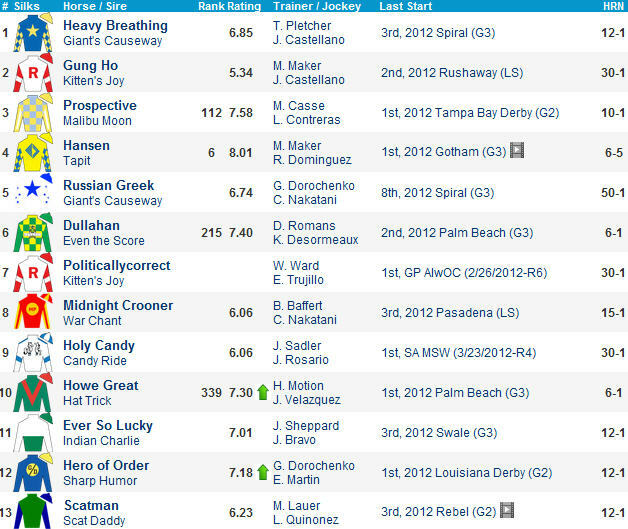 #9 Holy Candy (30-1) could be poised to surprise this field. He scratched out of the SA Derby in favor of this and Candy Ride is a fine synthetic sire. He has done the bulk of his training on Cushion Track and ran well in his Hollywood Park synthetic sprint bow last fall. The promising Sadler trainee looked great in March 23 graduation run and has faced some decent sorts in SoCal (Empire Way, Castaway, Stirred Up). Did you know that Drew Brees might have a Kentucky Derby horse? #3 Prospective (10-1) is 2-f0r-2 on Polytrack (Woodbine) and exits a good looking tally in the G2 Tampa Bay Derby (blinkers on). 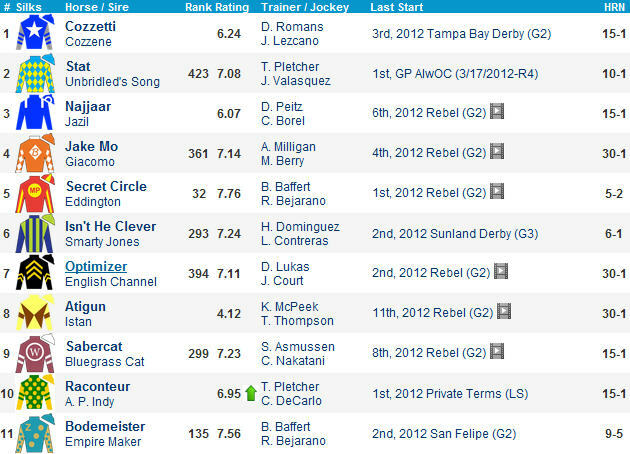 The improving sort owns a pair of graded route wins and should get pace to chase. 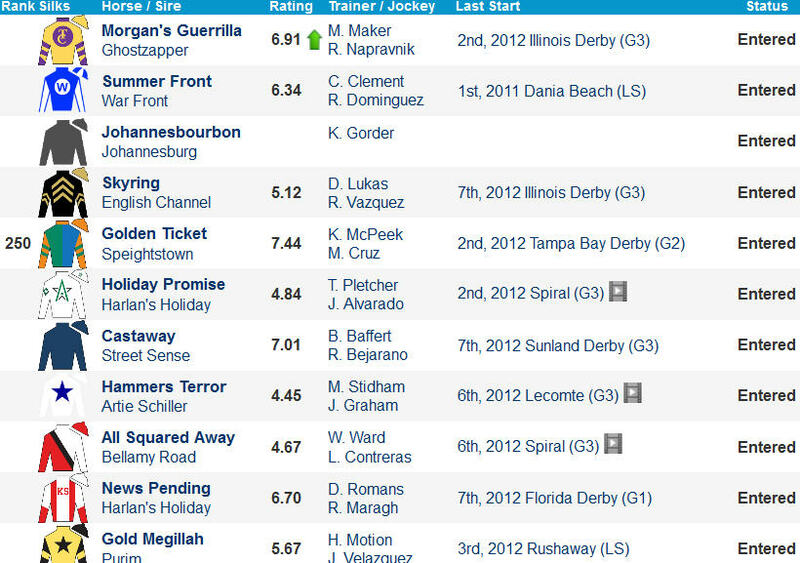 #6 Dullahan (6-1) won the G1 Breeders’ Futurity at Keeneland last year and fired a strong local bullet for this April 8. He has had a few setbacks this year (fever, minor splint injury) but ran well in the grassy G3 Palm Beach and appears to be back on track. #4 Hansen (6-5) is an obvious prominent throughout threat but he meets other speed and gets a stamina test at low odds. He is 2-for-2 on Polytrack (Turfway Park) but My Adonis, the horse he beat in his last pair, came back to disappoint in the G1 Wood Memorial last weekend. I woulf not be shocked if he won or finished up the track.